Choosing new glasses is a big decision – it’s not an everyday purchase so you need them to be right first time. You may love the frames but do they really suit the shape of your face? Are they right for the kind of lenses you need? Are they the best value? At Alton Eyecare Independent Opticians, we’re experts in what looks good and works best for you as an individual, so you can depend on us to help you make the right choice. Glasses are fashionable and functional, so it may take a little time to find the pair that suits you best. You’ll probably have an idea of the kind of frame style you want before you visit us but we recommend being open to ideas. You may find that something you thought would never work for you actually looks just right, so throw caution to the wind and try on as many frames as you can. 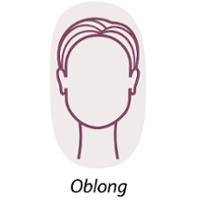 The oblong face is longer than it is wide and has a long straight cheek line. DO select frames that have a top-to-bottom depth – try round, deep or low-triangle shapes, or frames with strong horizontal lines and decorative or contrasting temples. The triangular face has a narrow forehead that widens at the cheek and chin areas. DO choose frames that accent the eyes and are wide enough to balance the jaw line – try frames that are slightly top heavy. DON’T select low-temple styles. 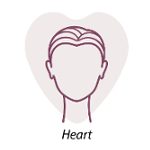 The heart-shaped face has a very wide forehead and high cheekbones. The face narrows gradually to the chin. DO choose frames that are light in colour; rimless styles are also effective – try frames that are wider at the bottom. DON’T select decorative frames or that are top heavy. A round face is just that – width and length in the same proportions and little to no angles. DO choose slightly angular frames – select high or mid-height temples to help create a longer profile. Try and avoid choosing excessively rounded or squared styles. An oval face is considered to be the ideal shape because of its balanced proportions. DO select frames that are as wide or wider than the broadest part of your face. DON’T choose frames with low temples. Frames come in all shapes and sizes, from Aviators to Wrap Around. Different frames suit different face shapes, so it’s important to get the style that best suits you; not just for style, but also for comfort. Classic ‘droplet’ style made popular thanks to Top Gun. These iconic frames are suitable for any face shape. Traditionally thought of as ‘horn-rimmed’, browline glasses frames are best suited to symmetrical, squarer shaped faces. The sharp angles of geometric glasses frames are less suited to round faces than other shaped faces. People with rounder faces should avoid oval glasses frames. Circles inside circles only serve to emphasise the roundness. People with round faces should consider rectangle frames. They break up the curve of your face and add new, contrasting lines. Like oval glasses, round glasses frames (John Lennon-style) are best suited to rectangular faces. Classic Wayfarers suit those with triangle, square and round shaped faces, however there are variants on the classic, so it’s possible to suit many face shapes. The thing to remember when it comes to frames and styles is that opposites attract. Round frames look better on square faces, while rectangular frames look better on round faces.